The team has been announced for the Lions’ warm up match tomorrow against the Barbarians in Hong Kong. With Sam Warburton missing the match with a knee strain which he has picked up in training, Warren Gatland has given the captaincy to Paul O’Connell. O’Connell captained the Lions on their 2009 tour of South Africa, and is captain of Munster, so is a very experienced and obvious choice to step into the captaincy role. In line with most people’s predictions, Gatland has chosen the majority of his team from Wales, there are 9 players in the starting 15 from Wales. All 3 Scots in the squad are starting tomorrow, 2 from England and finally O’Connell is the sole representative from Ireland. Here is the full starting line-up and replacements. What do you think of Gatland’s choices? Has he got the right balance? In this blog I derived, from first principles, the Lorentz transformations which are used in Einstein’s special theory of relativity to relate one frame of reference to another frame of reference which are moving relative to each other with a speed . So, these relate the length and time in two different reference frames which are moving relative to each other with a velocity . One of the most intriguing and surprising consequences of Einstein’s special theory of relativity is that time is relative and not absolute. What this means in simple terms is that two observers in two reference frames and moving relative to each other with a velocity will measure time to be passing at different rates. This phenomenon is known as time dilation. Let us consider our two reference frames and . We will have a clock in frame , which in that reference frame is stationary (e.g. a clock on a rocket ship, although the rocket ship is moving, the clock is stationary relative to the rocket ship). Two successive events on the clock in are separated by a time interval which we are going to call the proper time . The time interval in the other reference frame, , is . How does this compare to ?. In the reference frame the clock is stationary, so we can say that the location of the clock in the x-dimension, , does not change. That is, . This means the time interval in frame will appear to be dilated by a factor of compared to the proper time interval . We observe the effects of time dilation every day in Nature. 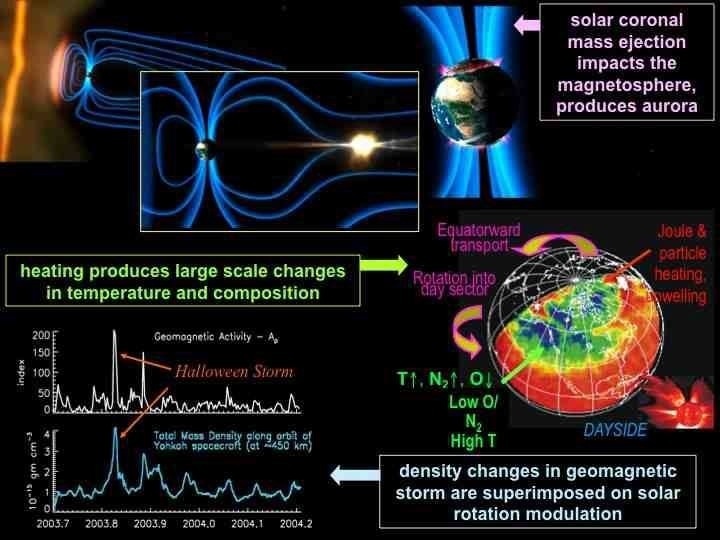 Cosmic rays, high energy particles from space, strike molecules in our atmosphere and create particles from the high energy interactions (this is the same as happens in the Large Hadron Collider). One of the particles created in these reactions are muons, which decay very rapidly in about 2 microseconds second (2 millionths of a second). Given the distance between where they are created in the upper atmosphere and the Earth’s surface, they should not survive long enough to make it to the surface of the Earth. But they do. How? Because of time dilation, the muons are moving so quickly that is appreciable more than 1, meaning that 2 microseconds in the muon’s frame of reference is much longer in our frame of reference. So, in the muon’s frame of reference it is indeed decaying in let us say 2 microseconds, but in our frame or reference it could survive for maybe a millisecond (thousandth of a second) or more, long enough to reach the surface of the Earth. One aspect of relativity which confuses a lot of people is that it is symmetrical. Although an observer in frame will think that the clock in frame is ticking more slowly, if an observer in were to look at a clock which was at rest in frame , that observer would think that the clock in frame is moving more slowly. Each would think that their clock is behaving normally, and it is the clock in the other’s reference frame which is showing the effects of time dilation. If a twin sets off on a space trip where the rocket will travel close to the speed of light, then time dilation effects will come into play. This means that e.g. a 20-year old twin can set off on a space trip which for the twin who stays on Earth appears to last for 40 years, but because of time dilation effects maybe only 5 years will appear to pass for the twin on the rocket. Thus, the 60-year old twin who stayed on Earth will be greeted after 40 years by a 25-year old twin!! In the example I have shown, 40 years for the twin who stays on Earth appears to pass as 5 years for the twin on the rocket. This means the time dilation factor is , and as the time dilation factor is just the Lorentz factor , this means the rocket will need to travel at a speed of of the speed of light. HANG ON!!! you say, what about the symmetry of relativity? Surely the twin in the rocket will think that the twin on Earth is aging more slowly, so why doesn’t he return to find the twin on Earth is only 25 and he is 60? Or maybe, because of the symmetry, they will both be 60 when the travelling twin returns? No, what one has to realise is that there is no symmetry in this trip. In order for the travelling twin to leave the Earth and travel at close to the speed of light he has to speed up considerably. Also, in order to come back he has to slow down and reverse his direction, speeding up again once he’s turned his rocket around to come back to Earth. And, as he approaches Earth, he will have to slow down again. These large accelerations (changes in speed) which the travelling twin experiences break the symmetry, and so it really is the case that the travelling twin will return younger than the twin who has stayed on Earth. How much younger depends on how close to the speed of light the travelling twin travels. Although it is possible therefore to “travel to the future”, as our twin in the example above does, what is not possible is to travel to the past. In order to do this one would need to travel faster than the speed of light, which Einstein’s theory does not allow. The results of neutrinos travelling faster than the speed of light, announced back in the Autumn of 2011, proved to be incorrect. One of the reasons that story caused so much interest is that travelling back in time has all kinds of problems associated with it, the movie “Back to the future” illustrated some of them. I will discuss time travel more in another blog. I will finish this blog with a question about photons (particles of light). Remember that Einstein’s theory of special relativity is based on the premise that light always travels at the same speed in a vacuum. The nearest star system beyond our Solar System is the Proxima Centauri system, which is 4.2 light years away. That means it takes light 4.2 years to travel from this system to us, which in terms of kilometres is 40 trillion kilometres ( kilometres!). Now you know why we use light years for such large distances. how long would it seem to take if you were a photon moving at the speed of light? Answers on a postcard, or in the comment section below. 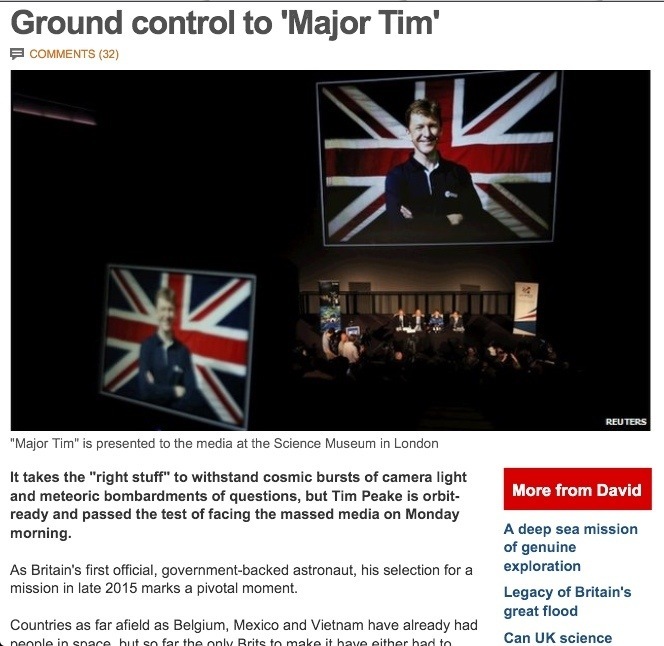 Last week, in a big media event at London’s Science Museum, it was announced that Major Tim Peake would become Britain’s first “government backed” astronaut. He is scheduled to go to the International Space Station in late 2015. He will not be the first British person in space, that was Helen Sharman who, in 1991, went into space through a joint venture between a number of private UK companies and the Russian government. There are also several British born astronauts who have gone into space through NASA, but to do so they have had to become US citizens. Michael Foale is the most well-travelled British born astronaut. In my opinion it is wonderful news that the Disunited Kingdom’s government is now officially getting involved in sending humans into space. Although we learn a great deal about the Universe beyond Earth when we send space probes, there is nothing which captures the public imagination more than sending humans into space. One only had to see the press coverage this announcement received to see the proof of that, and today’s teenagers will hopefully be inspired to take up a career in science or engineering through being inspired by people like Tim Peake. Of course the title of my blog is a play on the lines in David Bowie’s Space Oddity, so it also gives me a good excuse to add a YouTube clip of that wonderful song. 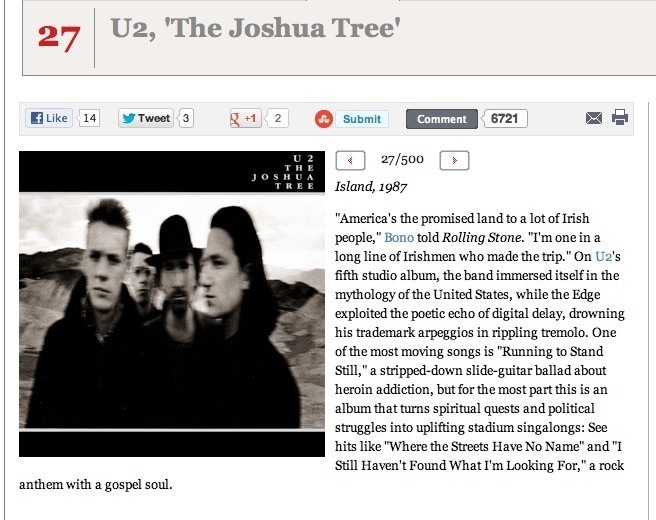 At number 27 in Rolling Stone Magazine’s 500 greatest albums of all time is U2’s “The Joshua Tree”. This was the album which propelled U2 from being a popular band to being the World’s biggest band. With songs like “When the Streets have no name”, “Bullet the blue sky”, “I still haven’t found what I’m looking for” and “With our without you”, nearly every song on this album ranks amongst some of the best work the band has ever done. I first bought this album as a record, back in 1987 when it was released. It was released at midnight on the 9th of March at record shops in the Disunited Kingdom and Ireland, and people queued up outside to be amongst the first to buy it. I was not one of those, but I nearly wore the grooves out playing it in the first 6 months I had it. I had a hard job deciding which song on this album to include a clip of, but finally decided on the amazing live version of “With our without you” from the U2 movie “Rattle and Hum”, a movie which contains live versions of most of the songs on this album. If you are a fan of this album then you should not only watch “Rattle and Hum”, but I would also recommend checking out the DVD on this album in the “Classic Albums” series. “The Joshua Tree” is not only my favourite U2 album, it is one of my favourite albums of the 1980s. Which is your favourite U2 album? And which is your favourite U2 song? 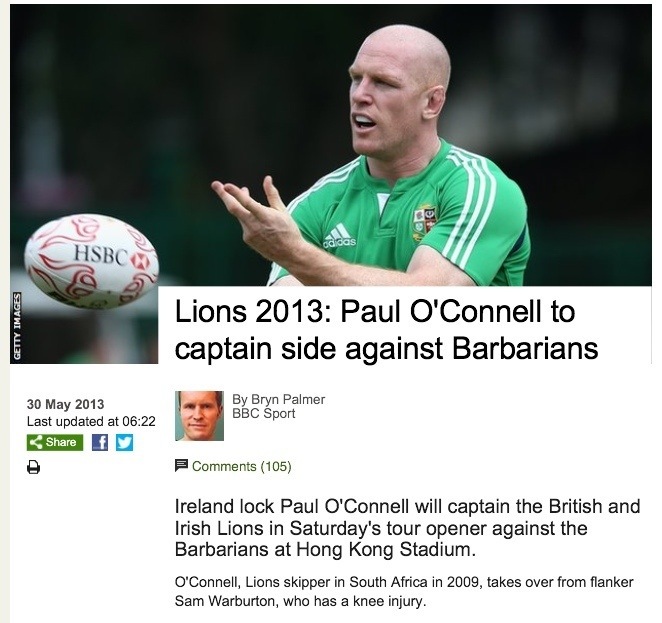 This coming Saturday (1st of June) the British and Irish Lions will play a warm-up match against the invitational Barbarians team in Hong Kong, before they head to Australia for their 2013 tour. The Lions, who tour every 4 years, have not won a tour since their tour of South Africa in 1997, which they won 2-1. Their 2001 tour of Australia resulted in a 2-1 loss, with the final test deciding the series. In 2005 the Lions suffered a “black wash” in New Zealand, losing the series 3-0. And, most recently, in 2009 they lost their tour in South Africa 2-1, only winning the final game of an already lost series. 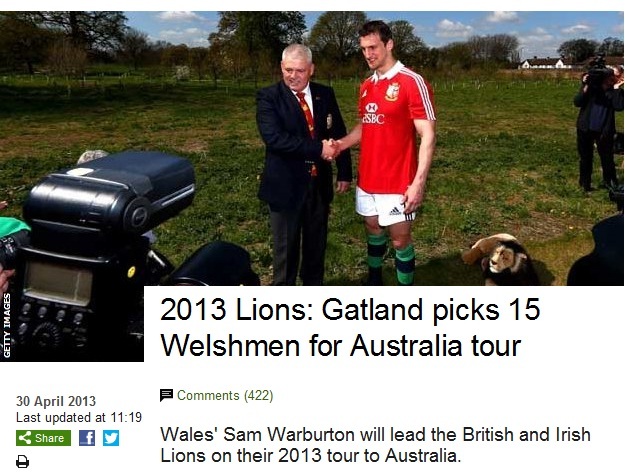 Warren Gatland has chosen Sam Warburton of Wales to captain the 2013 British and Irish Lions tour of Australia. The first rugby tour of the Southern Hemisphere by a team from Great Britain was in 1888. A 21-man squad from England, Scotland and Wales went on a 35-match (yes, thirty five!) tour of Australia and New Zealand. No matches were played against any “national” sides, but the tour established the idea of a touring party going to play against Southern Hemisphere opposition. A complete list of all Lions’ tours can be found here. As you can see from this table, the current format of a tour every 4 years, alternating between New Zealand, South Africa and Australia did not begin until 1993. Prior to that the tours tended to be every 3 years, and because of the sporting boycott against the apartheid South Africa, no Lions tours of South Africa took place between the tour of 1980 and the one of 1997. In total, the Lions have toured South Africa 13 times, winning 4 series, losing 8 and drawing 1. They have toured Australia 8 times, winning 6 series and losing 2. Finally, they have toured New Zealand 11 times, winning only 1 series (in 1971), and losing the other 10. Since the advent of the professional era in 1995, Lions tours have become shorter. Also, the number of test matches was cut from 4 to 3 on each tour back in 1980. This obviously reduces the likely hood of a drawn series, as a drawn match in rugby is much less likely than in e.g. football. The 2013 tour is longer than some recent ones, with several games against “provincial” and Super-15 sides. The full list of matches, including this Saturday’s warm-up match against the Barbarians, is shown below. 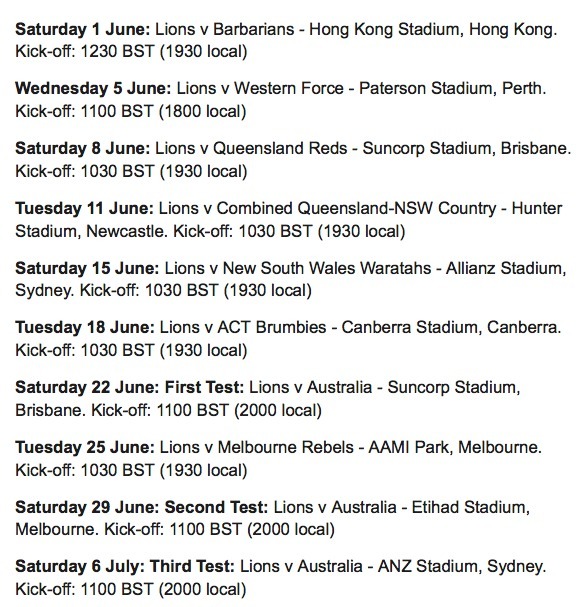 The schedule of matches for the 2013 Lions tour of Australia. As I mentioned above, the last time the Lions toured Australia was 12 years ago, in 2001. On that occasion, the Lions easily won the opening test in Brisbane, 29-13. However, they lost the second test in Melbourne by 35-14. The outcome of the series came down to the third and final test. With minutes to go and the score at 29-23 to Australia, the Lions had a line-out near the Australian line, providing a superb scoring opportunity to win the Test and the series. But, the ball was famously won by the Australian second-row Justin Harrison, denying the Lions the victory. The 37-man squad for the 2013 tour is dominated by players from Wales. The coach is Warren Gatland, who is on sabbatical from his position as Wales’ coach. This, combined with Wales having won the 6 Nations for the last two seasons, means the Welsh contingent was always likely to be the largest. There are 15 players from Wales, 10 from England, 9 from Ireland and 3 from Scotland. The squad captain is also Welsh, Sam Warburton, who becomes the first Welsh captain of the Lions since the 1977 tour of New Zealand when Phil Bennet was captain. The only member of the Wales starting line-up in the 30-3 annihilation of England back in March who has been left out of the Lions squad is the outside half Dan Biggar. Speculation is rife as to how many of the players picked to play the Barbarians in Saturday’s warm up match will be Welsh. We will find out soon enough, but I wouldn’t be surprised if it is as many as 12 or 13! This is partly because many of the English and Irish players have been involved in club-level matches right up to this last weekend (hardly any of the Welsh and Scottish players have been); but also because Warren Gatland has shown before that he likes to initially select from an already established group of players. In his first match as Wales coach (the opening match of the 2008 6 Nations), fully 13 (thirteen) of the starting line up were from the same club side, the Ospreys! The biggest challenge facing Gatland is the challenge faced by any Lions coach, to bring players from four separate countries together into a cohesive squad of players. He may be helped in this by having coached in Wales (he has been Wales’ national coach since December 2008), England (he coached the London Wasps club side for 3 seasons, 2002-2005) and Ireland (he was Ireland’s national coach from 1998-2001). So he can justifiably say that he is familiar with the rugby culture in three of the four countries which make up the Lions. We should know long before the first test on the 22nd of June how well he is succeeding in this task. The occurennce of the northern (and southern) lights should increase over the next several months. This is because the Sun’s surface is becoming more active, and it is eruptions on the Sun’s surface which cause these wonderful phenomena. Sunspots have been studied in detail since the early 1600s. After several decades it was realised that the number of sunspots on the Sun’s surface goes through a regular cycle. Although the strength of each sunspot maximum varies, this plot clearly shows that for over 400 years the number of sunspots increases and decreases with a period which averages to 11 years. The only exception to this is the so called Maunder minimum, which occurred in the second half of the 1600s. In the last decade we have developed a pretty good understanding of what causes sunspots, but we still do not know why they come and go with this 11-year cycle. In 1908 George Ellery Hale discovered that sunspots are areas of intense magnetic field. 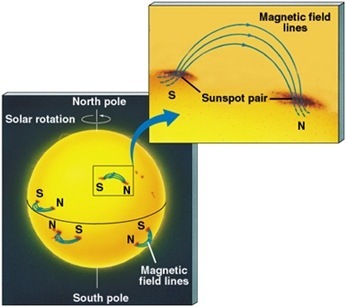 In fact, they occur in pairs, with one spot being the north pole of the magnet and the other spot being the south pole. 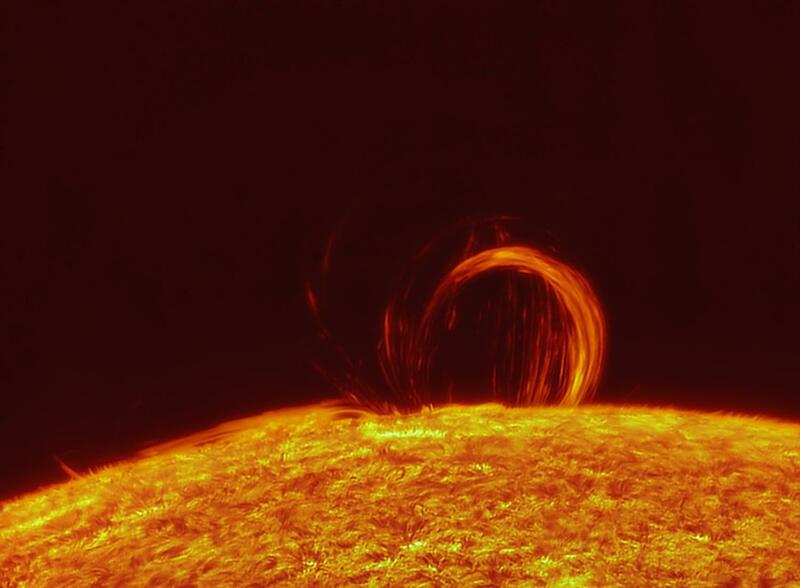 The magnetic field lines between a sunspot pair pull material off of the surface of the Sun, as shown in this photograph. 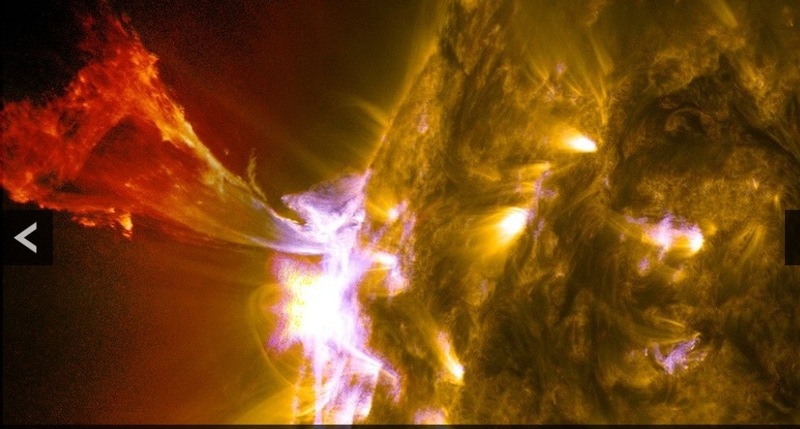 Most of the time this material flows along the field lines, but when the magnetic field strength becomes large enough the field lines can break, and when this happens a coronal mass ejection occurs. 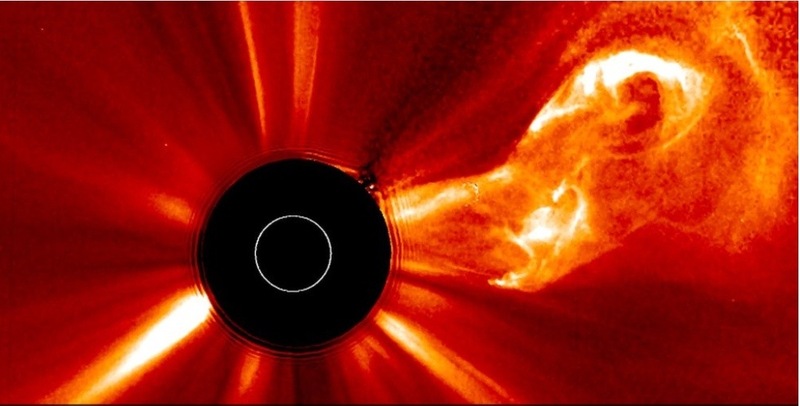 A CME is essentially an expulsion of charged hydrogen gas from the surface of the Sun. Hydrogen gas is just made up of protons and electrons, so a ball of protons and electrons hurtles away from the Sun’s surface. This huge ball of gas spreads out into the Solar System. Because it is an eruption from a particular point on the Sun’s surface, the charged particles travel in a particular direction. They typically travel at speeds of about 500 km/s, and so if they are coming towards Earth they take about 3-4 days to do so once they leave the Sun. If the charged particles in the CME hit the Earth they get directed by the Earth’s magnetic field to travel along the magnetic field lines. The field lines of course run from the magnetic north pole of the Earth to its magnetic south pole. As the charged particles travel towards one or other magnetic poles they pass down through the Earth’s atmosphere. As they pass through the atmosphere the charged electrons can excite atoms in the Earth’s atmosphere, and when these excited atoms de-excite, they emit light. This is exactly the same physics as happens inside e.g. a fluorescent light tube. Different elements emit different colours, and even the same element can emit different colours depending on how it is excited. This is what leads to the wonderful light show we see in the northern (and southern) lights. 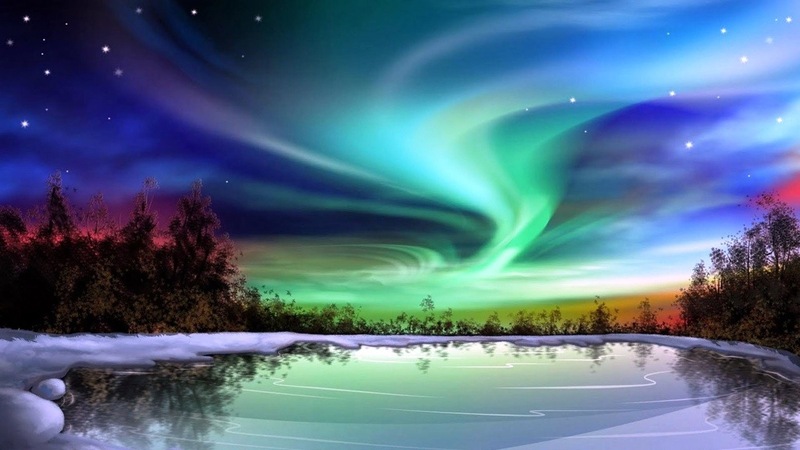 Here is a wonderful time-lapse video of the northern lights. As the photograph and video show, the atmospheric light-show that is the northern (or southern) lights is incredibly beautiful. So, with the sunspot cycle coming back to its maximum, the next several months provides you with a good chance to see them. It will be a sight you will never forget. I found this graphic which I thought was quite good. 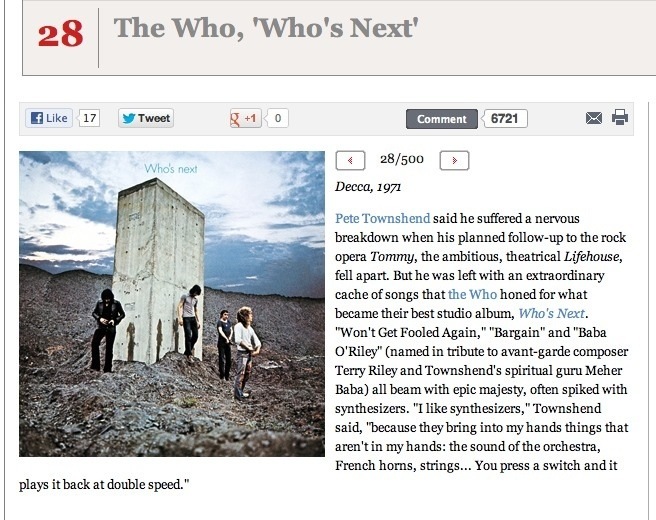 At number 28 in Rolling Stone Magazine’s “500 Greatest Albums of all time” is the Who’s 1971 album “Who’s Next”. The only Who album I own is a Greatest Hits album, and so I must admit I don’t know most of the songs on this album. But it does include my all-time favourite Who song, “Won’t get fooled again”. This epic song, Pete Townsend’s cynical assessment of the broken promises of change in the 1960s, is well worth a listen if you are not familiar with it. Here is a YouTube clip with the lyrics. Which is your favourite Who song?